Ancient Egypt is known for its magnificent and beautiful tombs. The most well known are within the pyramids in the Valley of the Kings or the tombs from the Age of the Pyramids (during the Old Kingdom, 2650 to 2150 B.C. spanning from 3rd to 6th Dynasty). While these elaborate tombs were quite ornate, the bodies of people from the lower castes met with humbler ends. 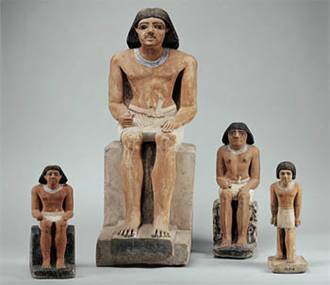 The tombs of Lower Egypt and Upper Egypt had two different styles of construction. The Upper Egypt styled tombs were located at the upstream end of the wadi. These were tombs cut into subsoil bedrock. An example found in the necropolis, was a tomb that was excavated which “had a long narrow trench with an L-shaped hole cut into the middle of the floor. There was not any superstructure associated with it. Surrounding this stone tomb were animal burials, including hippopotamuses, elephants, crocodiles, baboons, cattle, goats, sheep, and dogs. Some of the animals were mummified and probably had civic-ceremonial significance.” The stone cut tombs, even though they may not have been elaborate and not decorated, are indicative of a higher class status in the Egyptian society. 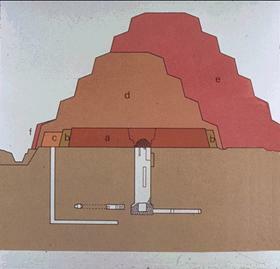 The descriptions of the stone tombs are similar to Mastabas, “rectangular, flat-topped stone-built structures that covered deep shafts leading to the burial of the tomb owner”. Nobles and courtiers were found buried in Mastabas within the royal cemeteries. Some of these tombs were more expansive in that their tombs would also have additional shafts or tunnels which would lead to other chambers for family members or valuables,. Many of these tombs would have a serdab, a small chamber that would house a statue made to resemble the deceased. There would also be statues of the deceased at different ages of his life, and there could even be statues of the deceased’s family or slaves in this chamber. This design was also carried on in the great pyramids with royalty. Four Statues of the Artisan Inti-shedu. Painted limestone, at Egyptian Museum, Cairo. 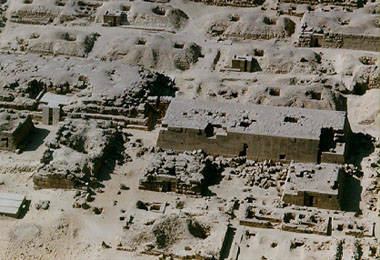 The Pyramid of Khufu was more complex due to the series of passages leading to several chambers. It was customary to have the King’s chamber directly in the center and below the ground level of the pyramid. This was the case with the pyramid of Khufu, but the entrance was set at 17 m (55ft) above the ground level and was only intended to be used once for the burial. 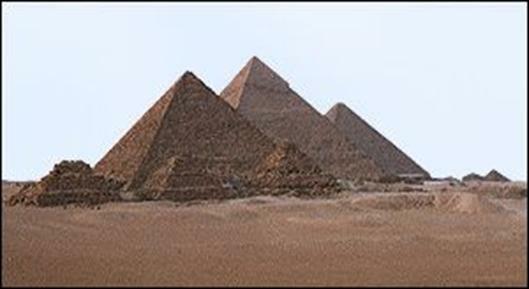 (Special scaffolding was used and then dismantled after Khufu was placed in his tomb.) The main entrance then branched into the Descending Passage which then went downward below the ground level into the bedrock until it reached the Subterranean Chamber. The Descending Passage spanned about 18 m (60 ft) from the main entrance, and this passage then branched out to the Ascending Passage, that was found with three large granite blocks sealing the passage. The Ascending Passage also lead to the Queen’s Chamber, but this was not actually the Queen’s Chamber after investigation. 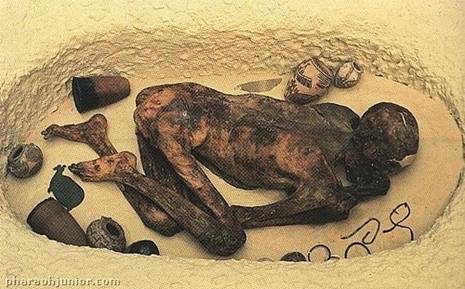 The belief was it was the chamber that housed the statue of Khufu, for his ka to reunite after death. The Queen’s chamber also intersected with the end of the Grand Gallery, another passageway at 47m long and 8.5 m high. It is believed this passage held some of the larger blocks that were used to block the passages after the pharaoh’s funeral. There is another tunnel that comes downward through the core of the pyramid and bedrock that ends where the Descending Passage and Subterranean Chamber meet, that was believed to provide air for the builders of the pyramid. Lastly, “at the upper end of the Grand Gallery, another level corridor runs south into the King’s Chamber, a simple, rectangular room faced entirely with red granit. All that remains in the room now is a granite sarcophagus in which King Khufu was buried, near the western wall.” There openings to shafts that run from the King’s and Queen’s chamber up to the exterior of the pyramid, that have been blocked, which might have also been air passages. Even with these deterrents robbers were still able to get inside and steal all the valuables.